Creating fixed keycodes for CDXZipStream is useful in situations where a proxy network is blocking the regular registration process, or if you would like to activate another user’s software without sharing credentials. - From the CDXZipStream command bar in Excel, click on the CDXZipStream “Account” icon. - Click the “Register/Upgrade” button in the upper right-hand corner. 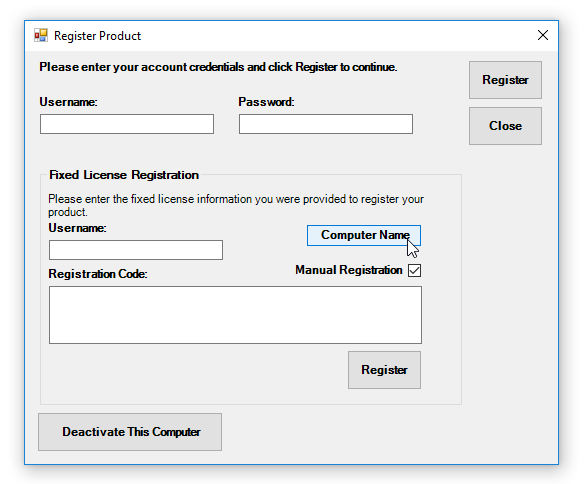 - In the “Fixed Licensed Registration” section, click the “Manual Registration” checkbox. You can highlight the computer name and from the right-click menu, select “Copy”. - From the CDXZipStream dropdown menu, select “Account Status”. - Click on the “Options” button and select “Add Fixed Keycode”. - A new registration code will be shown. You can double-click on the listed code and from the right-click menu, select “Copy”. Go back to the Fixed License area, then enter the computer name and new registration code. After registration the latest ZIP Code data can be downloaded. If you prefer, we can generate the registration codes if you send us the additional computer names as described above. The demographic areas covered in all ACS feeds are: age, population, household size, household income, individual earnings, race and ethnicity, educational attainment, school enrollment, housing value and rent, mortgage status, and marital status. For a full listing of all data fields included in the feeds, please download the CDXZipStream Data Feeds and Definitions file here. If you already own CDXZipStream ACS Premium and have an active data maintenance contract select the "Account" option on the CDXZipStream Excel menu and click on "Check for Available Database Updates". The select the option to update your premium database. For users without an active account you can update your data feeds by logging into your on-line account on CDXTech.com and under My Account and Product Management, selecting "Buy Data Update" and then purchase the Premium Maintenance contract. If you don’t have the correct CDXZipStream version select "Upgrade License" in the account area and select the option to upgrade to the ACS version. The latest data will automatically be included with your purchase. We've added a new template to our suite of CDXZipStream tools for FindZip Analysis. This template can take a long list of city and state combinations and produce a report of all matching ZIP Codes. The template can be downloaded for free from the templates page of our website. It is compatible with both the trial and registered versions of CDXZipStream. While you can always copy the original FindZip formula to analyze a list, this template streamlines the application. Rather than returning all ZIP Codes in a single string (as the formula does), each ZIP Code is output to a separate cell in the template. This makes it simple to copy the lists to another application. The template can handle up to 250 ZIP Codes per city/state entry. As with our other templates, you will see a status indicator showing the progress of the FindZip calculations in the lower left status bar. With the release of this application we now have templates that automate each CDXZipStream function. You can download this new FindZip tool and all of the other templates here. We recommend the use of these templates rather than copying formulas when analyzing long lists. We also provide video tutorials demonstrating how to use many of the available templates. We’ve added a new template to our suite of CDXZipStream tools for FindZip Analysis. This template can take a long list of city and state combinations and produce a report of all matching zip codes. The template can be download for free at this link. It is compatible with both the demo registered versions of CDXZipStream. While you can always copy the original FindZip formula to analyze a list this template streamlines the application. Rather than using delimiters as the formula does each zip code is output to a separate cell. This makes it simple to copy the lists to another application. The template can handle up to 250 zip codes per city/state entry. As with our other templates, you will see a status indicator showing the progress of the FindZip calculations in the lower left status bar. With the release of this application we now have templates that automate each CDXZipStream function. You can download this new FindZip tool and all of the other templates here. We recommend the use of these templates rather than copying formulas when analyzing long lists. We’ve also included videos demonstrating how to use many of the available templates. We are pleased to announce the introduction of Version 3 of our CDXStreamer Excel add-in for address verification and ZIP+4 data. The add-in loads directly in Microsoft Excel and adds custom functions to update your spreadsheets with address data. CDXStreamer is the perfect tool when you have a list of addresses with missing ZIP Codes or that needs accuracy checking. It uses a U.S. Postal Service database to insure your addresses are formatted correctly and are deliverable. With Version 3 we have dramatically improved the speed of the product. Users can expect to see a greater than 5X improvement in speed per address. You will also see similar improvements in our free Address Verification template that works with CDXStreamer. Our CDXStreamer product includes the add-in discussed above along with our online tools for address verification and demographics. This includes an Address Correction and ZIP+4 Lookup and ZIP Code Demographics Batch Report tools. CDXStreamer is available as a month-to-month or fixed yearly plan with pricing starting at less than $5 per month. Registered users can obtain these changes by simply downloading and installing CDXStreamer version 3.0.1 or better.